from a recharge agent – there are over 30 across Canberra, issuing standard (adult), tertiary, concession, and student MyWay cards. from an Access Canberra Service Centre. online – complete the standard (adult) MyWay application or student MyWay application (allow up to 7 days for postage; postage charges apply). by phoning 13 17 10 – for standard (adult), tertiary, and student MyWay cards (allow up to 7 days for postage; postage charges apply). 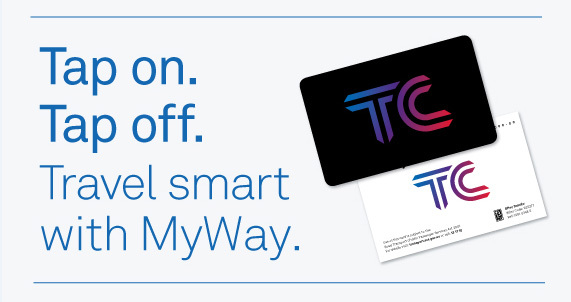 MyWay fares vary depending on any applicable concessions. Check your MyWay concession eligibility. If you don’t buy MyWay online, remember to register your MyWay card when you receive it to protect your travel balance. COTA ACT manages Seniors Cards in the ACT, which are combined with Transport Canberra MyWay cards - one card allows for public transport access, and the Seniors Card discounts and services. If you are over 61, a permanent resident of the ACT and working 20 hours or less each week you are eligible for an ACT Seniors Card. For further information ACT Seniors card. Seniors Card holders from other states and territories in Australia can apply for an Interstate Seniors MyWay card. Interstate MyWay card holders receive the same concession fare as ACT Seniors and MyWay pension card holders and are able to travel for free during off peak times as part of an ACT Government trial. Interstate card holders are not eligible for the over 70s free travel. Interstate Seniors Card holders can also show the bus driver their Seniors Card and purchase a cash concession fare. Interstate Seniors MyWay cards can be applied for in advance from COTA ACT. To apply, please email seniorscard@cotaact.org.au or myway@act.gov.au with your name, date of birth and address, and include a scanned copy of your Seniors Card and Drivers Licence / Proof of Identity card. An Interstate Seniors MyWay card will then be mailed to you. Please allow up to 10 business days to receive your card. As part of an off-peak trial, eligible senior and concession MyWay card holders travel for free between 9am and 4.30pm and after 6pm weekdays, plus all day Saturday, Sunday and on public holidays. Find out more about eligible concessions.